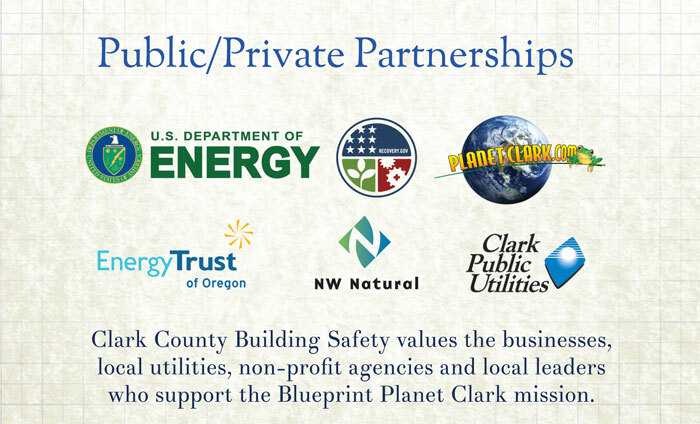 Planet Clark is a public-private outreach and education partnership group. It originated as a joint program of three areas in Clark County government, Energy Efficiency Services, Building Safety, and Environmental Services, and was developed following a grant from the U.S. Department of Energy to provide free duct and home performance inspections for qualified homeowners. After testing more than 750 homes over two years, where nearly 80 percent were found to have significantly leaky ducts, it was clear that the need to implement energy efficiency measures and educate the public on what they can do to save energy was more important than ever. 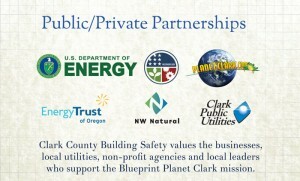 With the support and generous contributions of private business partners, Clark Public Utilities, Northwest Natural Gas, and Energy Trust of Oregon, an independent non-profit organization dedicated to helping utility customers benefit from saving energy and generating renewable power, Planet Clark brings a wide range of expertise and resources to the local community that is unparalleled in most outreach programs. Planet Clark partners and collaborates with local contractors and suppliers by providing education and outreach at partner sponsored events, like Parr Lumber’s annual fall luncheon. Partners represent designers and architects, building products and services, HVAC contractors, National Green Building Standard (NGBS) verifiers, home performance auditors, certified green home builders and developers, solar contractors, and other companies that support these enterprises. Clark County furthered the Planet Clark mission of encouraging public-private partnerships by donating a plot of unused land for construction of a safe, affordable, NGBS-Emerald home for a family in need. With the non-profit Evergreen Habitat for Humanity as a partner and Quail Homes as the builder, the Planet Clark Emerald House was designed to meet five complementary green building standards. For more information, see www.Emerald.PlanetClark.com. By encouraging leadership in energy efficiency and sustainable design and construction, Planet Clark supports those builders, like Urban NW Homes, who continue to raise the bar. Urban NW Homes was recently recognized by the National Association of Home Builders with the first certified Green Development on the West Coast. Local leaders have also offered their support for the Planet Clark mission, which is vital to the program’s continued success in public outreach and education. For more information go to PlanetClark.com.